The millennial generation is rapidly disrupting society in many ways. Yet, when it comes to their personal finances, they face a significant learning gap, which slows down the path to their financial independence. All too often, college graduates and entry-level professionals quickly realize the major life decisions and responsibilities that their degrees did not prepare them for. Many are not prepared to think about getting their own car insurance, accumulating good credit, getting their own health insurance, or even investing in the stock market. The concept of being an “adult” so quickly can be a rude awakening for the millions of millennials who finish their degree and are highly educated in textbook materials, but less so in finances. 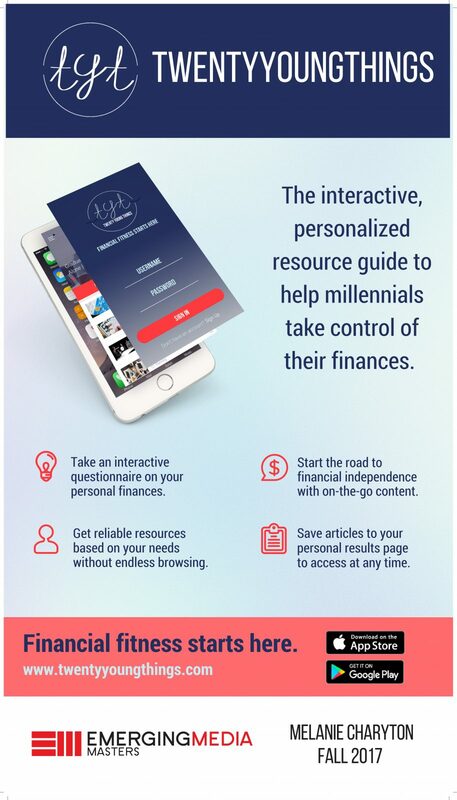 TwentyYoungThings is an app designed to reduce this learning curve by providing a hub of personalized, curated, branded content that facilitates the journey to financial fitness. The app is simple to use. Users begin by taking an interactive quiz to gauge their level of interest in a particular topic, from repaying loans, managing health insurance benefits, filing taxes, building credit, to investing in the stock market. The results are calculated and a curated list of branded content allows users to begin exploring articles on the topics they chose to learn more about. Users can save articles to access later by creating an account. For brands in the financial services industry, TwentyYoungThings provides a clear platform to market to millennials, a demographic this industry finds increasingly difficult to reach due to shifting behavior, media consumption and lack of aspirational appeal of their brand and offering. Millennials value high quality content, and brands need opportunities to add value through such content. TwentyYoungThings is a way for brands to increase positive brand perception and start building relationships by giving them simple resources to get learn about managing their finances. TwentyYoungThings can serve as a starting point to close the learning gap and ease the journey to financial independence. It’s the platform that addresses millennial’s need for guidance as they continue to conquer their future. Join us, the journey to financial fitness starts here.